They haven’t forgotten the past, they’re just repeating it! Horizon in the Middle of Nowhere, or Kyōkaisen-jō no Horaizon in Japanese — which literally stands for Horizon on the Borderline — is a 13-part anime written by Tatsuhiko Urahata, directed by Manabu Ono and produced by the studio Sunrise. 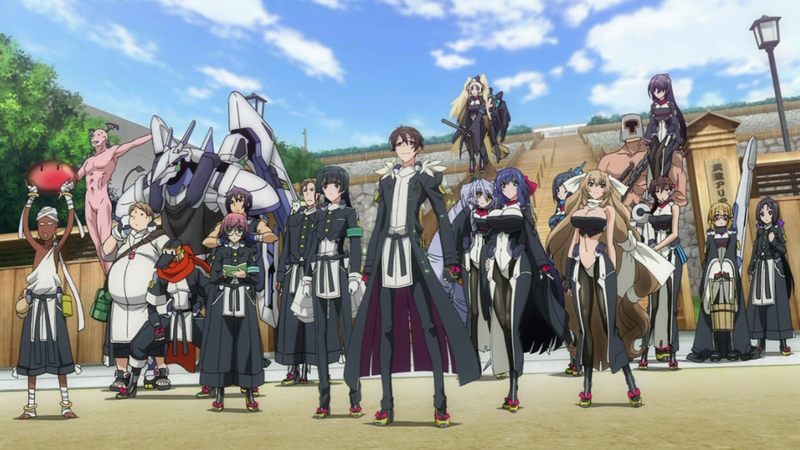 Adapted from a Japanese light novel series created by Minoru Kawakami and illustrated by Satoyasu, the Horizon in the Middle of Nowhere story is one small part of an expansive narrative universe, with the tale taking place in the distant future of Owari no Chronicle, another of Kawakami’s light novel series, which works as the anime’s pre-prequel. Unfortunately, as a result of the intricacy and involvement in the show’s imaginary documented history or, if one is not too familiar with the highly complex world fashioned by Minoru Kawakami, the anime incarnation of Horizon in the Middle of Nowhere is rather difficult to understand or follow, as it encompasses a myriad of unusual characters — some with tricky names to grasp — involved subplots, and layers upon layers of fictional historical references. Never take your eyes off the target! The basic plot of the anime is as follows. In the far distant future, humanity sets off into the far realms of outer space, abandoning Earth for a lengthy period of time. However, due to an unknown phenomenon that prevents mankind from traveling too far into the uncharted, humanity is forced to return home, only to find their planet devastated, ravaged, desolate and inhospitable, leaving Japan — known as the Far East — as the only livable location. To accommodate the entire human population, pocket dimensions, along with various floating ships, are created around Japan to house the populace. In order to figure out what had happened in the past, which not only caused mankind to leave Earth, but also stopped them from fully expanding and migrating into space, the humans begin reenacting historical events according to the Holy Book Testament, starting from the beginning of real time. But in the year 1413 of the Testament Era, the nations of the pocket dimensions invade and conquer Japan, dividing the territory into feudal fiefdoms — based on the historical Warring States Period in ancient China, the 250 years between 475 and 221 BC — forcing the original inhabitants of Japan to be banished. With no place to call home, the refugees now reside on an enormous hovering city-type ship called Musashi. At present — the time in which the series is set — we find ourselves in the 17th Century of the Testament Era, with the Musashi constantly roving around Japan, while being scrutinously watched over by the Testament Union, the authority that runs the reenactment of history. In spite of this, rumors of a pending apocalypse and war begins to spread when the Testament stops revealing what happens next, after the year 1648. So, Horizon in the Middle of Nowhere is essentially positioned in the midst of the Warring States Period, but this era is now melded with a strange mix of ultramodern science fiction, seeming magic, off-the-wall characters and a slew of different factions and forces. While struggling to get your head around the arduous plot, episode 4 introduces a loony character — Motonobu Matsudaira, Lord of the Capitol city of the Far East, Mikawa — who decides he’s going to mess everything up for the Testament Union, by attempting to reshape the world — annihilating every single person in Mikawa, by destroying it — thus challenging the rest of humanity to figure out a way to stop the cataclysmic wheels set in motion, further convoluting the knotty narrative, though demonstrating to audiences the bizarre way in which this futuristic world operates. This catastrophic event now sets the stage for the two main opposing forces; the weaker one being the small semi-independent Musashi ship — housing some hundred-thousand residents — and the larger, more superior force, being the Testament Union, adhering to the role they must play in which they reenact everything. With a convoluted, disjointed and somewhat unclear background account and a muddled narrative concept, Horizon in the Middle of Nowhere now calls for its characters to draw audiences into the storyline. Due to the extensive number of players in the light novels, most of them make at least a token appearance in the anime, with some being more central to the action than others. Therefore Horizon in the Middle of Nowhere has an enormous cast of players, who come and go so fast that it becomes near impossible to figure out — or remember — who is who, who is related to whom, and what their connections are with one another and the story being told. 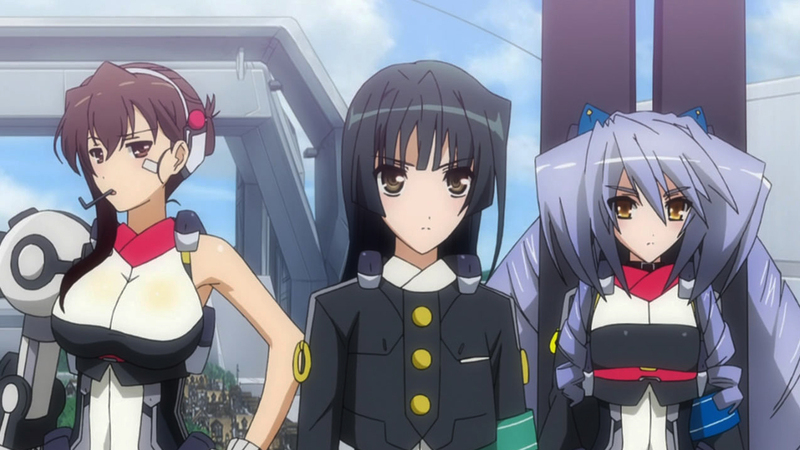 Even the academy members, who become the focus point of the anime as they embark on a perilous mission to save an emotionless doll named Horizon from the Testament Union, are one too many, and while several do get some decent screen-time, most get blurred in the anarchy of proceedings as the story unfolds; nevertheless, the colorful cast is generally easy to identify by visual design alone. The characters in Horizon in the Middle of Nowhere, while having amazing potential, are sadly underused, as many of them are tossed aside or simply just underdeveloped. 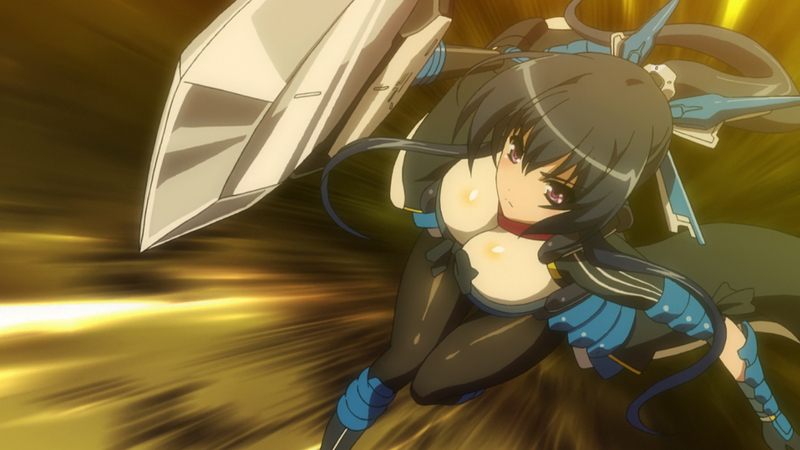 The opening episode gives audiences a generic chase sequence, where everyone in Class 3-Plum, at the Musashi Ariadust Academy — the chief educational institution of the independent territory of Musashi — is attempting to get a single hit on the young female, named Makiko Oriotorai, who happens to be the classes’ homeroom teacher, and is mostly referred to as ‘teach.’ Here, viewers discover just how skilled these characters — or students — are, as each is introduced with bursts of rapid fire or zealous swordplay, showcasing their extraordinary abilities, resulting in a visibly stunning affair, as there are so many tantalizing bits and pieces to all these personalities; though, many of character’s attack techniques and skills are overly stylish, giving us little understanding of their meaning or how these abilities are used or conjured up in battle. As the story moves forward, we realize that it focuses on two principal players; the fairly irresponsible male student, Tori Aoi, who is the chancellor of Musashi Ariadust Academy and president of its Student Council, and, with her long silvery-white hair and ocean blue eyes, Horizon Ariadust, a childhood friend of Tori’s, killed in an accident ten years prior, who was reborn as an automaton — a mechanical doll — named P-01s, whose true identity was kept a secret until the final moments of Mikawa, before its destruction. On a side note, Tori’s design is a real winner and comes across as peculiarly unique, with his feather adorning overcoat and dangling earrings, which are bizarrely connected to lengths of shiny string that are attached to various parts of his school uniform. Tori — as the main protagonist of the show — is utterly hilarious, being a goof in so many ways, simply living out his life for mere enjoyment. The overarching narrative of Horizon in the Middle of Nowhere, in its most basic form, revolves around Tori, who is attempting to tell Horizon that he is in love with her and longs to be with her; something his friends and classmates are all encouraging him to do. However, because of the incident which took place in Mikawa, throwing everything off balance, Horizon gets whisked away as a captive by the Testament Union — and a whole lot of mumbo-jumbo about some Deadly Armor Sins, or Mortal Sin Armaments, gets brought up, which makes little to no sense at this point — leaving Tori and his classmates in a position to go save Horizon, using this opportunity to their advantage, to seize and regain their homeland in the process; although, going after Horizon will ultimately result in war between the two main sides, placing a lot of people at risk and threatening the very balance of the world. Balloons, Cranberries and Grape Fruit! Much of Horizon in the Middle of Nowhere is about familiarizing audiences with the basics of the characters, while setting up the mechanics which lead the protagonists on a campaign to rescue Horizon, yet the result ends up feeling so overwhelmingly complicated, and for no good reason. The convoluted nature of the story, and the plethora of characters it involves, does cause a slight drawback in terms of entertainment, but while those aspects are indeed problematic, there’s also a real beauty to the whole thing. The animation is stellar, the character designs are outstanding — bar a couple of far to chesty girls — and the action is truly spectacular, even if it sometimes comes across feeling nonsensical and is without any grounding or consistency. The anime has a real sense of intensity and energy, blending seriousness, humor and interlaced story elements, though it is, to some extent, difficult trying to identify with its principal cast, bar Tori and Horizon — which is still somewhat tenuous — and appreciate the world setting, both being fundamental basics when trying to immerse oneself into a series. Produced by Sunrise, which is among Japan’s largest and most famous animation studios — responsible for anime shows such as Accel World (2012), and Cowboy Bebop (1998) — Horizon in the Middle of Nowhere has a very strong pictorial design and aesthetic, with fluid animation and a great amount of detail in its characters, locations and environments. The action sequences are honestly out-of-this-world insane — in the best possible way — and the visuals, as a whole, are really quite intriguing and impressive. Horizon in the Middle of Nowhere incorporates many different concepts all in the one place, and manages to pull it off rather brilliantly, combining a modern day Japan feeling within its cityscapes, futuristic aspects in its air-born ships, with the interior/ exterior building and landscape designs giving off a kind of earthly feel, all incredibly refined; although, the design ingredients are so disjointed that one can hardly imagine how they all came together in a natural form. Ultimately, Horizon in the Middle of Nowhere does grow on you, as it captures the imagination and is a visual marvel, with gorgeous animation, excellent design work and compelling action, being one of the most vibrant and detailed worlds that’s graced our screens. While the narrative, with its outlandish mix of genres — science fiction, mecha, magical girls and fan service — may be too difficult for some to swallow, particularly if not already steeped in the lore of the series, it’s still worth giving Horizon in the Middle of Nowhere a go, as it might gel with others more than it did with me — admittedly, I have a pitiable knowledge of historical events, and history in general, which probably didn’t help whilst watching the show. Having finished the first season of Horizon in the Middle of Nowhere, I do feel as though I have come out the other end with a better understanding of what this series is all about; here’s hoping that the second season clears up some of my reservations, delving more into its character’s past and make-up, while simplifying, or clarifying, the excessively messy narrative.